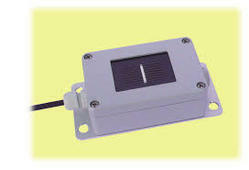 Silicon irradiance sensors (Si sensor) show a cost-effective, but rugged and reliable solution for the measurement of solar irradiance, especially for the monitoring of Photovoltaic (PV) systems. Based on the construction of the sensor element corresponding to a PV module they are ideal as reference for the monitoring of PV systems. Especially the spectral response comparable to PV modules as well as the similar inclination error (incident angle modifier) allow an exact analysis of PV energy yields using Si sensor data. In 2009, Sivara Enterprises was instituted and since then we have been acclaimed as the most excellent firm involved in manufacturing, trading, supplying and exporting whole range of Process Control Instrument. Being a certified firm, we aim at providing the best quality of products which ranges from Weather Station Monitor Sensor, Flow Meter and PID Controllers. Known for its robust design, high performance and longer working life, we are also specialized in manufacturing customized products as desired by our client. We while manufacturing the products keep the international standard in concern and each and every product before being traded and exported has to undergo a quality check and thus we maintain superior quality and performance. We export our products across the globe. These products are highly demanded in the industry because of its multiple applications. Other than all its qualitative appearances some of the products that we manufacture are even waterproof. The components that are used are high quality standards are qualified to. We are also recognized for manufacturing a wide range of products with qualitative features which are actually appreciated and valued by the industry people. To suit the client’s requirement, we as per choice also manufacture product specially customized for them, meeting up with their needs and expectation. The use of latest technology, latest innovations and proficient team, we have established ourselves as a one stop solution provider. Our products are highly valued for its invincible quality and superlative usage.